By now, saltwater anglers realize the importance of adult menhaden, or bunker, and the symbiotic relationship bunker play within our ecosystem. 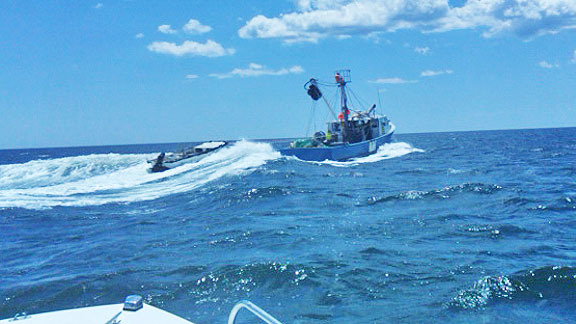 Bunker are the true lifeline to the entire striped bass population along the east coast. What's more, bunker are filter feeders, and without them only bacteria and jellyfish can eat the plankton floating in the water. The complexity here is that jellyfish also eat fish fry as well as fish eggs. In short, bunkers play a pivotal role in balancing the ecosystem. Right now, the Atlantic Coast, specifically New Jersey, is witnessing a crushing blow to its Atlantic menhaden or bunker fishery with an unprecedented disturbance to the heart of the striped bass migration. For weeks, large purse-seining vessels have situated themselves immediately off our coast while spotter planes and helicopters locate schools.